Mature pack rats can grow anywhere from eight to 20 inches in size. Although they usually make their home outdoors, they will regularly venture indoors in search of food. As all rodents carry diseases, having a pack-rat infestation in and around your house is really bad for both hygiene and personal health. These infestations can sneak up on you because most rats reproduce every few months with many babies per litter. If you ever find yourself with a pack-rat problem, you should nip it in the bud before it gets any worse. As with all problems, the old saying "prevention is better than cure" is relevant in relation to pack-rat infestations. The most important thing is to check that there are no holes anywhere in your house that lead from the outside in. This means checking everywhere, including walls, doors, fly screens and vent coverings. Don't be slack because pack rats can squeeze through a hole no bigger than a quarter. In addition you should also make sure that all food containers are shut with a tight lid, whether they are inside or outside the home—this includes outdoor garbage bins. The general rule is to keep your home and surroundings free of any food debris that might attract vermin. This includes cleaning up thoroughly after an outdoor party and making sure that pet food isn't left outdoors in bowls for any longer than is necessary. A way to deter rats from entering your home is to keep any likely entrances into your home scented with either peppermint oil, oil of cloves or mint. Do this by soaking cotton balls with your chosen scent and leaving them around the house where rats are likely to enter. Target doors, cabinets and garbage bins. An upside of using deterrents is that no rats are killed in the process and the scent also repels flies. If a more aggressive tactic is required, you can sprinkle instant mashed potato flakes and/or instant oats near places where rats are likely to enter your house. Rodents find these tid-bits particularly appetizing and will very likely feast on them. However, these pieces of food will swell up in a rat's stomach, blocking its digestive system and causing it to die after a few days, solving your rodent problem. If you want to see the fruits of your labor, but don't want dead rats lying around the house, consider traps. You can use a combination of live and snap traps, but be aware that snap traps can kill a mouse and also hurt children or pets if wrongly handled. If you want your traps to be effective, move the surroundings around to try and disrupt the rat's routine. 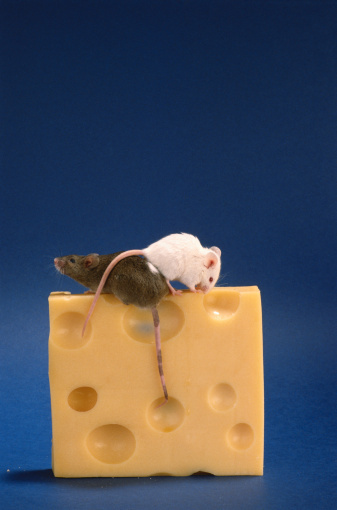 This makes it more likely for the rat to make a wrong move and fall prey to your trap. Good bait for your mousetraps are banana, bread, cheese, bacon and other types of really strong-smelling foods. Molleen Stapol is a graduate of the University of Nevada at Las Vegas with a degree in criminal justice. She launched her writing career in 2009, working on freelance assignments for eHow.com and Trails.com. Her areas of expertise include gardening, travel and the great outdoors.